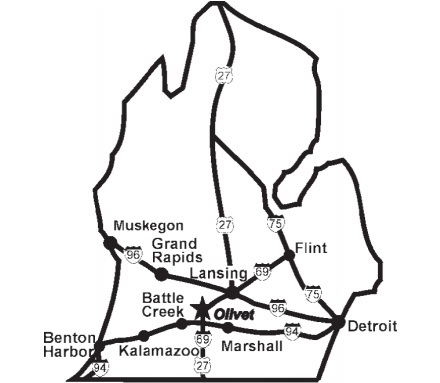 Olivet College is located in South Central Michigan, 30 miles southwest of Lansing, the state capitol, and 125 miles west of Detroit. It sits on a rolling hilltop shaded by huge maple and oak trees in the city of Olivet, a friendly community of 1,700 persons. The College surrounds the parklike College square for easy access on foot. When you arrive on campus, look for the directional registration signs with The Great Lakes Retreat logo. From Detroit: Take I-94 west to Exit 110. Follow north about 10 miles to the College. From Lansing: Take I-69 south to Exit 51 (Ainger Road), turn left. At next stop sign turn right to the College. From Kalamazoo: Take I-94 to I-69 north. 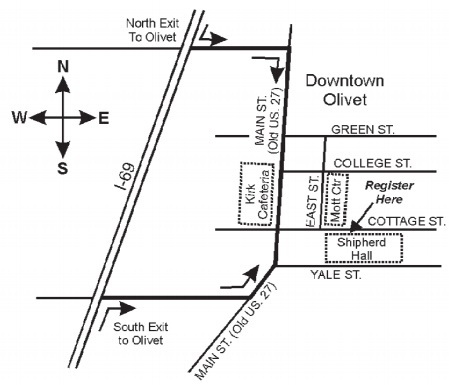 Follow to first Olivet exit (Exit 48), turn right at stop sign. Turn left at next stop sign, follow to College (about 1/2 mile). From Mt. Pleasant: Take 127 south to I-69 at Ainger Road (exit 51), turn left. At the next stop sign turn right to the College.